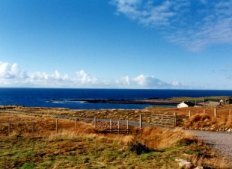 Our house at Reiff - known as The Top House - sits on its own up on the hill overlooking the sea. 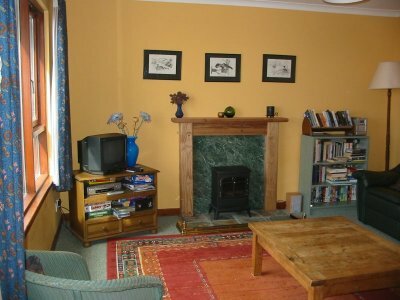 It was built in 1993 to traditional design and is extremely well equipped and looked after. We hope you enjoy it! The lounge has two leather sofas and a rocking chair, plus colour TV, Freeview digital TV, video, DVD player with a selection of DVDs and tapes (including kids ones) and a hi-fi centre. The view here from the lounge is out towards the point of Reiff and towards Lewis. The kitchen is fully equipped with an excellent cooking area and adjoining dining area. 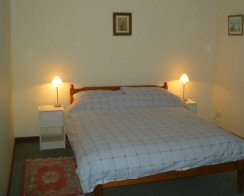 Fittings include modern electric cooker, dishwasher, microwave, fridge freezer, kettle, toaster, coffee maker, radio and all utensils you will require for your stay. The dining area has a pine table and seating for six. This looks out from the front of the house to a stunning view similar to the lounge. There is also a high chair and all utensils needed suitable for a baby. 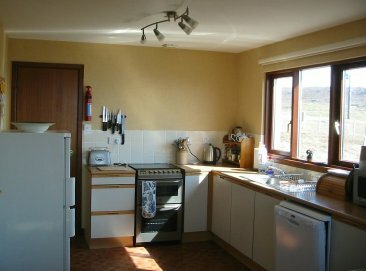 To the back of the kitchen is the utility room with automatic washing machine and tumble dryer. 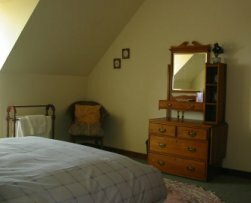 The house has one Kingsize bedroom and one twin room upstairs and one room on the lower floor to the rear of the house,can be either twin or super king. 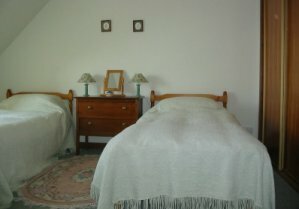 All have fitted wardrobes, dressing tables, chairs, side tables and, of course, cosy beds with duvets and double pillows. The upstairs rooms in particular have terrific views out to sea. On a clear night you may not want to pull down the blinds but instead look out to the stars. In summertime, it doesn't fully get dark at night and you can read a paper outside at midnight if you so wish! We are also fully equipped for babies with a cot and all the bedclothes you would need. There is a shower and WC downstairs and a bathroom and WC upstairs. All linen and towels are included. Please note this is a non-smoking house.